And although I didn't have bell bottoms or platforms to wear, I soon realized that I would actually wear a lot of the clothing that was exhibited (ie. the peplum top and skirt seen above, how cute, right?). In fact, it reminded me of my Dad, who used to sew his own clothes, suits and shirts. He even made dresses for me and my sister and maxi dresses for my Mom (and THIS). 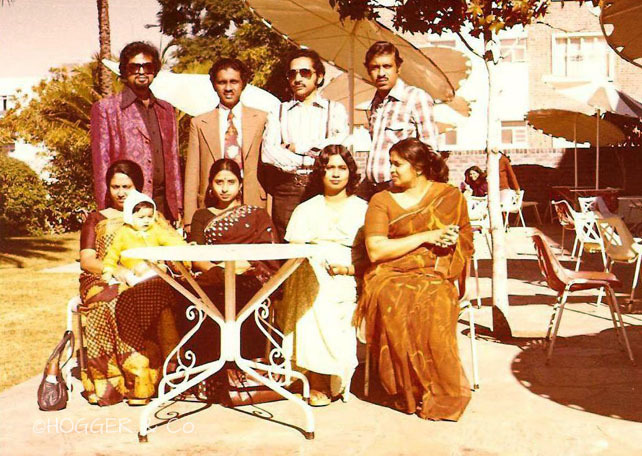 Here are my parents (far left), my Dad in a suit he stitched, and my Mom in a beautiful indian sari. The baby is my sister, in both photos. It's interesting to see the ethnic influence on the clothing of the 70s from Indian textiles to the North African djellabah (hooded cape of sorts) and the Middle Eastern caftan. If it was long, it was worn in the 70s, right? 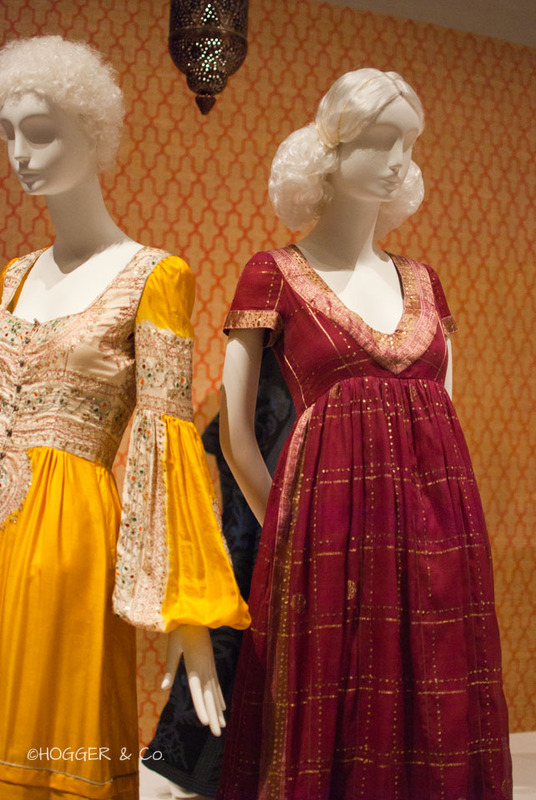 After the Beatles traveled to India in 1968, indian-style clothing became popular. 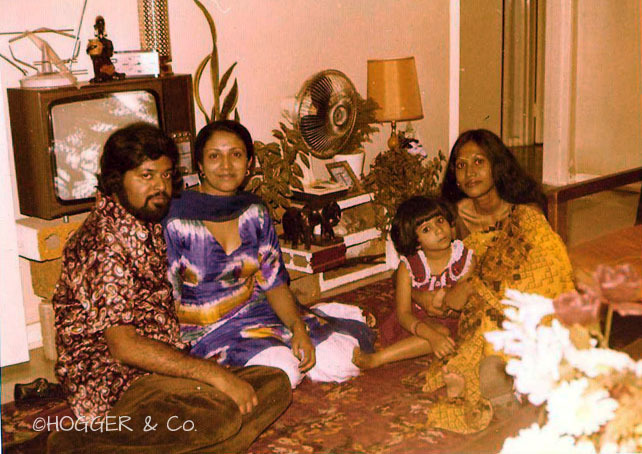 Here, my Mom and Dad (far left) in clothes sewed by him. 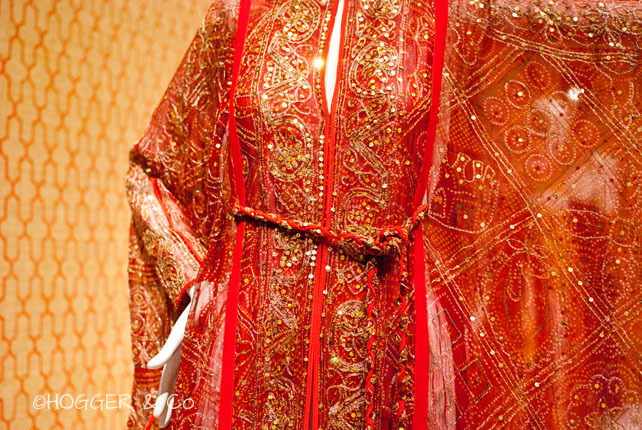 Designer Arnold Scaasi used Indian silk, influenced by the sari, for this gown that Barbara Streisand wore in 1970. Totally wearable today, right? The notion to make ones own clothes, not only was a means to reject consumerism, but also saw the start of many crafty techniques used to revive clothing, such as painting on old leather (as designer Charlotte de Vazquez did, below) tie-and-dye, macrame and knitting! When you think hippie, you may think tie-and-dye, which designer Halston used for his fall-winter 1970s collection, collaborating with artists of Up-Tied, to create this pantsuit. Patchwork was another great craft of the hippie era, and here's a dress I would totally wear. 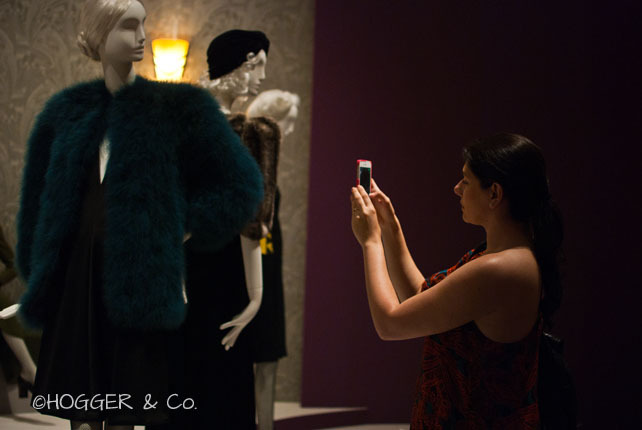 Designed by Yves Saint Laurent, for his 1969 haute couture collection, and crafted of over 200 pieces of silk. 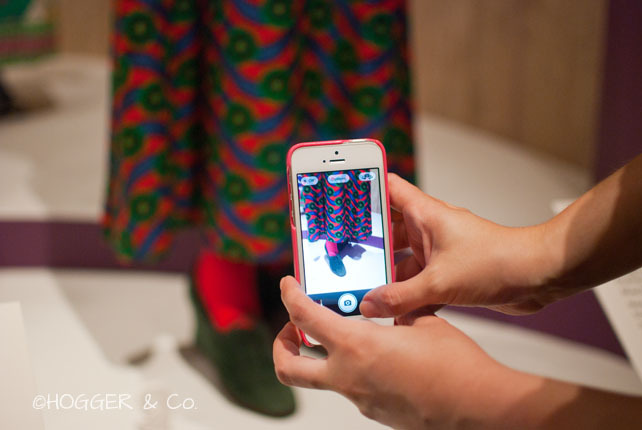 Here's an original Missoni, recognizable to us now for the bold patterns and knit work. 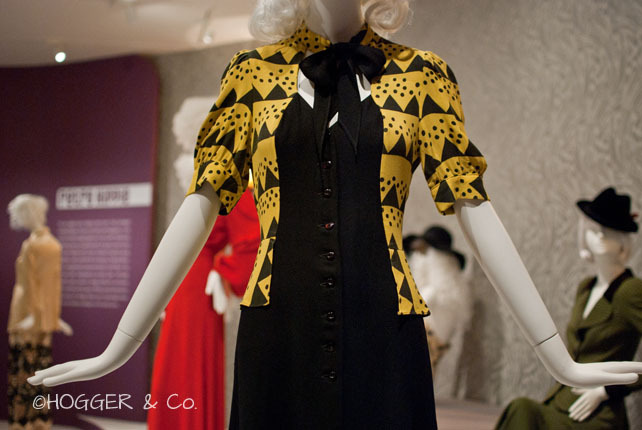 This was created in 1972 as a knit ensemble at a time when knitting was encouraged for both men and women! I don't think animal prints are going away any time soon. And this two-piece snakeskin look is so Fall 2013, no? Gosh, I love it, so. 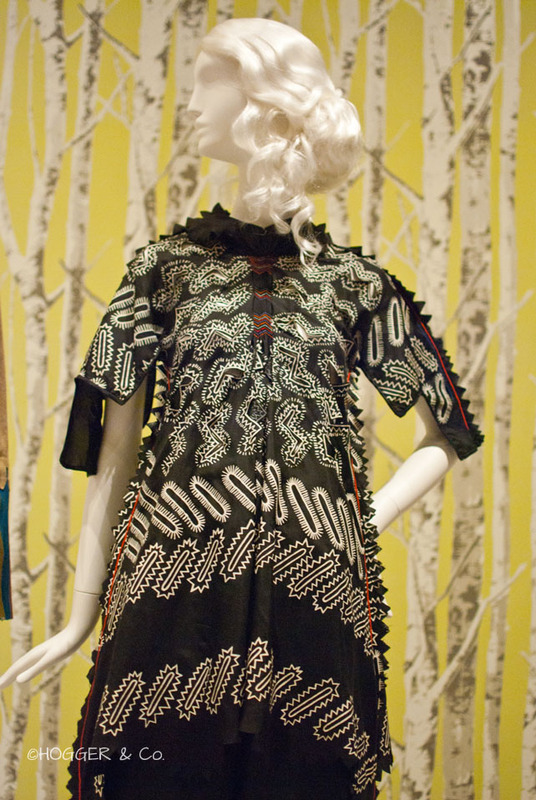 Designed by Bill Gibb, whose collection in 1972 was inspired by animal prints and textures. I wasn't sure how I liked the look below, but the more I stared at it, the more I wanted it to be mine. Designed by Zandra Rhodes, her designs were influenced by Renaissance elements such as slashed fabrics and external seams. Oh, the Chastity belt. I had to include this! Designed by Carl Schimel and created as part of a jewelry series "The Seven Sins of Kim", and advertised to college girls and hippies, alike. The medallion is meant to be a sort of pill box (for birth control). Notice the wonderful wig-work created by Jason Allen, who has created heads of hair for Boston Ballet, and other local companies. Be sure to play the hippie-est song from the jukebox (yes, there's a jukebox!) to get you in a groovy mood while looking through this fun 60s and 70s collection...OH, and bring your parents. They are bound to love it. 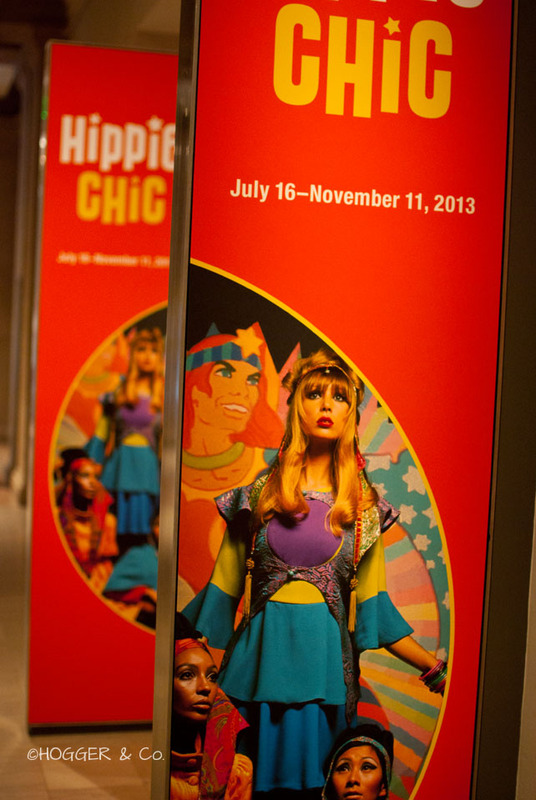 The Hippie Chic show is on now until November 2013, for tickets, visit the MFA website.